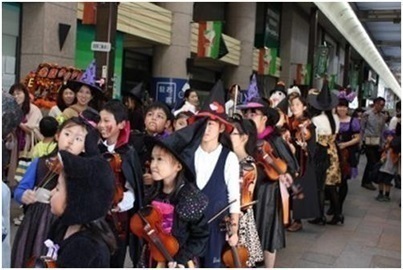 "Burakuri Happy Halloween" is an event held at the Burakuri shopping district, where candy rallies, workshops and parades take place, turning the streets of Wakayama city a thrilling spectacle anyone and everyone can enjoy regardless of age. Everyone is invited to spend a joyful day with us around downtown. Machinaka Koryu Space "Minna no Gakko"